What it really suggests is: the Democratic bench is now so thin that the party cannot even give its voters a real choice. At this point, the only three other candidates seriously considering the race are: Martin O’Malley, former Maryland governor who is decidedly lackluster; Jim Webb, the quirky one-term senator who — oh by the way! — used to work in the Reagan Administration (Democratic voters will love that); and Bernie Sanders, who does not even call himself a Democrat (he’s a socialist). Now take a gander at the party’s Senate caucus. If you squint really hard you might imagine some of them could be presidential material, but not really. The overwhelming majority are too old, too dull, too new, or barely won reelection. Elizabeth Warren is the only exception out of these 45 senators, and she looks like she is not going to run. It’s apparent that the vast majority of Democratic senators are fossilized old farts that are best categorized as yesterday’s news. That’s if the political analysts are being charitable. By comparison, the Republicans have a lengthy list of impressive candidates. Governors like Scott Walker, Rick Perry and Bobby Jindal are top tier candidates for president. Susana Martinez is frequently mentioned as a potential VP pick. Brian Sandoval is seen as the candidate most likely to unseat Harry Reid in Nevada. That’s before talking about Marco Rubio and Mike Pence as potential presidential candidates. Jeb Bush didn’t jump into the race early from a position of strength. He did it out of necessity. Finally, there’s this: Hillary will face a distinct enthusiasm gap between herself and the Republican nominee as long the nominee isn’t Jeb Bush or Chris Christie. Candidates like Scott Walker and Marco Rubio have a youthful energy about them. Hillary will cruise through the Democratic nomination without getting challenged. That’s a big problem because competition sharpens candidates. Lackluster enrollment in private plans and drying-up federal funds may force Minnesota to pick up more of the tab for its health insurance exchange. MNsure would get another $11.7 million of state money under Gov. Mark Dayton’s proposed budget for technological improvements, a necessary change because public-plan signups have far outpaced private-plan enrollments. The governor is also recommending the state assume costs the federal government covered until this year, such as $1.3 million over the next two years for staff to review rate submissions from insurance companies and another $558,000 to investigate complaints. Most federal funding has expired as Washington’s aim is to make state-run health exchanges self-sufficient. Together, those changes would bring the state’s running costs for the exchange to at least $23.5 million since it was set up in 2013. Lawmakers set up MNsure mostly with federal funds, aiming to sign up Minnesota residents in both private plans and public programs for lower-income families like MinnesotaCare and Medical Assistance. State officials initially estimated about two-thirds of enrollments would be in those programs, with the remaining third in private plans. Instead, 91 percent of applicants have been placed in public programs, forcing the state to pitch in more money. That’s unsustainable. Perhaps it’s unsustainable for the short term. That’s even questionable. There’s no doubt that it isn’t sustainable for the long term. MNsure officials say they’ve altered their budget to put the exchange on a steady financial course, upping its fee on premiums from 1.5 percent to 3.5 percent and scaling back costs. But their three-year budget plan hinges on continually adding more new members in private plans than enrolled the year prior. Anything that can’t be sustained won’t be. Inevitably, MNsure will be unaffordable. When (not if) that happens, the DFL will have egg on their faces. Republicans will criticize the DFL for implementing something that was expensive to the taxpayers and eventually, unsustainable financially. Mitt Romney announced Friday he will not run for president in 2016, after briefly flirting with a third White House run — a decision that only slightly narrows the crowded field of potential Republican candidates. “After putting considerable thought into making another run for president, I’ve decided it is best to give other leaders in the Party the opportunity to become our next nominee,” Romney said in a written statement. He also was announcing his plans on a conference call with donors Friday morning. Though this is a bit of a surprise, it might be as simple as Mitt being unable to put together a national organization rather than him not wanting to run. It might also be that he’s finally accepted the fact that he’s history in the eyes of GOP activists. Lots of people, myself included, think he would’ve been vastly superior to President Obama. Obama’s national security policies are a disaster. President Obama’s economic policies have revived terminology like new normal. President Obama’s economic policies haven’t revived talk about a booming economy. Mitt won the nomination in 2012 against a weaker field than this year’s field of candidates. Adding to Mitt’s worries is the fact that he started talking like a liberal. That isn’t how to win the GOP nomination. Mitt was a compromised candidate in 2012, too. He couldn’t take the fight to President Obama on President Obama’s biggest failure, aka Obamacare. This time around, Mitt would’ve had to fight against the economic accomplishments and conservative reforms of people like Scott Walker and Rick Perry. The simple fact is that Mitt couldn’t win. For years, SCSU’s failures have been visible for those willing to see what they actually saw. That required President Potter and then-Provost Malhotra to pretend that they didn’t see what they were seeing, at least when they talked with reporters or with the public. They don’t have a choice anymore. Facing a multi-million dollar deficit, SCSU finally has to admit that they aren’t right-sizing. SCSU has to admit that the school’s finances have been mishandled. First, rising enrollments during the recession masked inefficiencies and poor practices that were revealed as enrollments began to decline in the economic recovery. These practices included a failure to pursue market opportunities, inefficient scheduling and faculty assignment adjustments, elective offerings beyond what was required, and ineffective program review process that did not encourage innovation in our academic programs. TRANSLATION: SCSU didn’t identify “inefficiencies” or make recommendations that would strengthen the University. Instead, SCSU hired consultants that recommended papering over SCSU’s inefficiencies with an expensive rebranding effort. Even more concerning, they found that negative perceptions from many outsiders who control the “blogosphere” are not grounded in reality. In their language, we have a “brand gap”, a gap between perception and reality. LFR relied on verified information from credible sources on campus. The things I reported, like the transcript fraud scandal or the enrollment decline, were later written about by so-called real journalists at MPR and the St. Cloud Times. LFR was the first media outlet that reported on ISELF’s empty rooms, a story that KSTP found compelling enough to assign Tom Hauser to. SCSU’s problem wasn’t that there was a gap between my reporting and reality. SCSU’s problem was that there was a huge gap between President Potter’s spin and reality. Now that SCSU’s finances are in the crapper, SCSU is (grudgingly) admitting that they’ve made lots of major mistakes. Secondly, leadership transitions during the last three years made it difficult to maintain focus on essential changes. While morale on campus dropped precipitously, key administrators left the sinking ship. There’s no polite way of putting this. Even if there was, it shouldn’t be sugarcoated. These administrators were hand-picked by President Potter. If administrators left, it’s because President Potter either made poor choices or the administrators left because of the poor morale on campus. Either way, it’s a challenge of President Potter’s own making. In the chart published by SCSU, FYE enrollment is down 15%. That’s because it’s based on FY2009’s FYE enrollment. 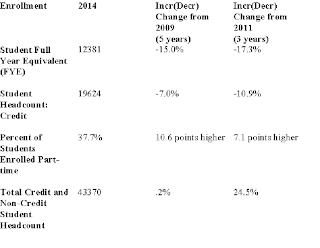 The chart put together by Silence Dogood highlights the FYE enrollment by fiscal year. 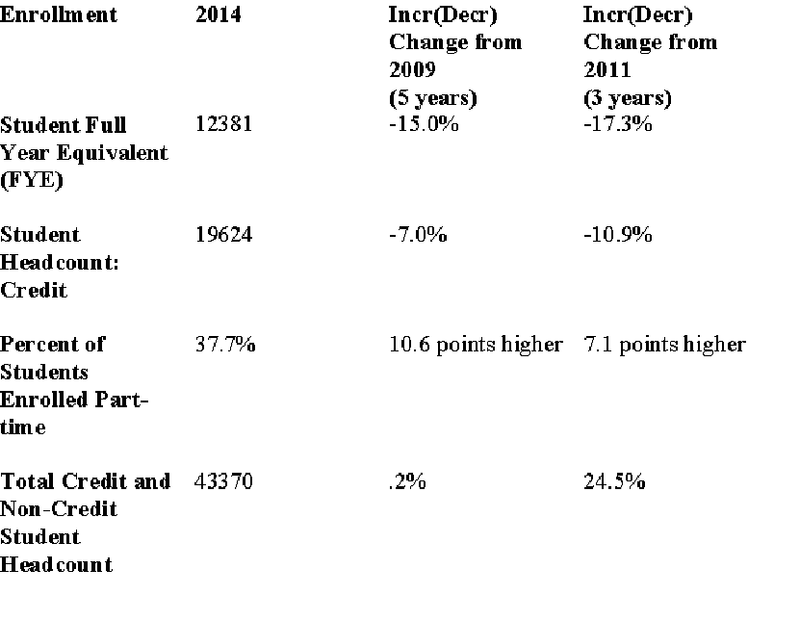 SCSU’s high in terms of FYE enrollment was in FY2010. Since then, FYE enrollment at SCSU has dropped by 18%, not 15%. It’s sad that President Potter can’t resist being dishonest with enrollment. MnSCU’s thirty-seven page budget proposal contains information about the system’s request for $142 million in additional funding. On Tuesday, January 28, 2015, Gov. Dayton released his initial budget proposal for the funding of higher education in Minnesota for the next biennium. In his proposal, Gov. Dayton stated that he won’t include additional funding for MnSCU in his budget proposals until the parties work out their “differences.” Specifically, the Governor is referring to the dispute between Chancellor Rosenstone and the seven MnSCU universities that have taken votes of no confidence in his leadership. In MnSCU’s Legislative Request, SCSU is asking for $14,825,000 ($10,850,000 for faculty and staff salary and benefits increases plus $3,975,000 for other inflationary and operating costs) in new revenue for the FY2016-FY2017 biennium. Unless President Potter wasn’t aware of the content of the page that was included in MnSCU’s budget proposal for the Minnesota Legislature or his memory is failing him or he is not being truthful, all of which are troubling if true, because the four bullet points listed are in fact speculations about what would happen if MnSCU received no additional funding. The four items on the list are pretty specific. Each MnSCU President was probably instructed by Chancellor Rosenstone to present the worst-case scenario about receiving no additional funding. In my opinion, that was probably not a good decision politically because most legislators do not like to publically be made to feel like they are being held hostage and if not funded there will be dire consequences. However, President Potter or his subordinates did as he was instructed. What’s worse than memory lapse, disengagement from what a subordinate did or simply not being truthful is that President Potter is prepared to blame the Legislature for not fully funding MnSCU and hence SCSU. He specifically stated this during his convocation address back in January. Unfortunately, regardless of legislative action, cuts are coming to SCSU! The general fund budget for FY15 presented on October 22, 2014 showed a deficit in the General Fund of $9,542,000. In the most recent budget document presented January 8, 2015, the total operating budget shows a deficit in the Net Operating Income of $7,431,000. These are huge numbers. Even if MnSCU got all of what it is asking for, it would still require significant and painful reductions. If MnSCU got all the additional money it asked for in their request, the total amount of money in the request for SCSU that is not going to faculty and staff salary and benefit increases is only $3,975,000 over two years. As a result, this will only provide $1,987,500 for each year of the biennium to cover SCSU’s FY15 deficit of at least $7,431,000. Preliminary budget numbers for FY16 show a deficit in the low range of $12,000,000, which is frightening. However, the high range is truly frightening! Despite all of the information showing that there is a significant financial problem at SCSU, President Potter seems to still be presenting a public face that everything is just fine. The employees at SCSU need to have accurate and complete budget information showing the financial condition of the university. More importantly, SCSU needs leadership that gets the story right. Refusing to speculate on the implications of MnSCU receiving no new additional funding at the same time the MnSCU’s legislative budget request spells out the implications pretty clearly is simply unacceptable. SCSU, perhaps now more than ever, needs leadership if it will ever regain the “flagship” status within MnSCU it so proudly proclaimed in the past. Transit is important to every community in Minnesota. 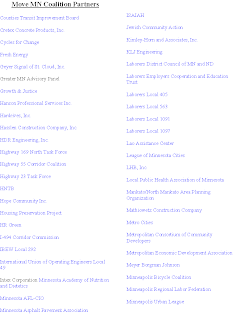 Move MN supports closing a sales tax loophole by dedicating all of the sales tax from leased vehicles to suburban highways and Greater Minnesota transit. The Twin Cities metro’s sales tax would be increased by ¾ cent and extended to the seven county metro area. It would fund improved transit connections in the metro area, increasing transit service hours and coverage. Ten percent would be set aside for bike/walk connection planning and implementation. Move MN supports greater efficiency and transparency with transportation projects, in addition to finding new funding sources that meet long-term obligations for all modes. Move MN believes efficiency includes finding cost savings; minimizing construction impact on traffic, businesses and customers; using 21st century materials and practices; and prioritizing projects with the greatest community benefit. Tuesday afternoon, Dan Ochsner interviewed Bethany Winkels, a field director with Move MN. During the interview, Ms. Winkels focused on fixing roads and bridges. 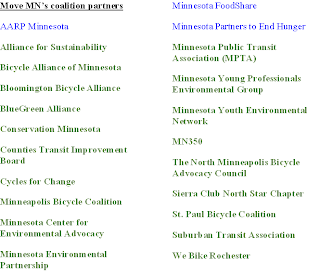 Move MN’s website, however, talks about developing a comprehensive transportation strategy. Talking up fixing roads and bridges in interviews but writing legislation that raises taxes to support transit expansion is deceptive, if not dishonest. 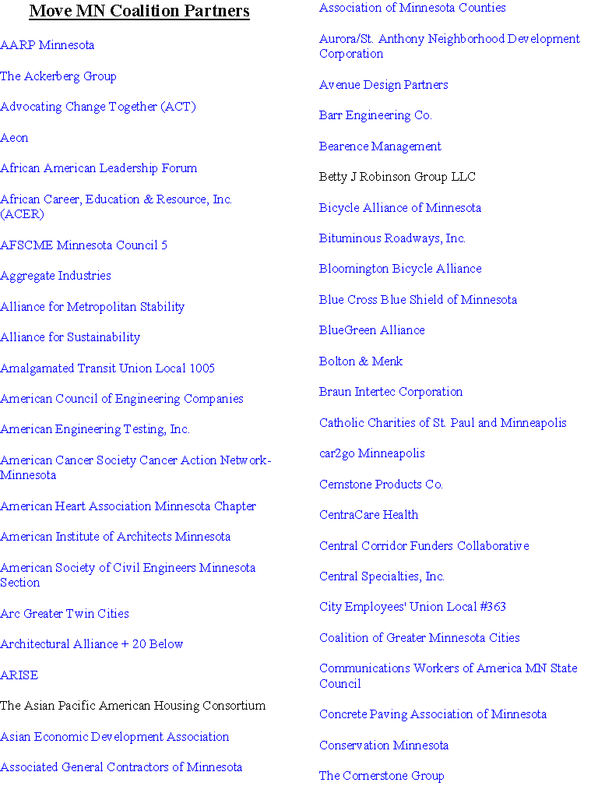 There’s no disputing that the vast majority of these coalition members are environmental activist organizations. Their agenda doesn’t put a high priority on fixing Minnesota’s roads and bridges. 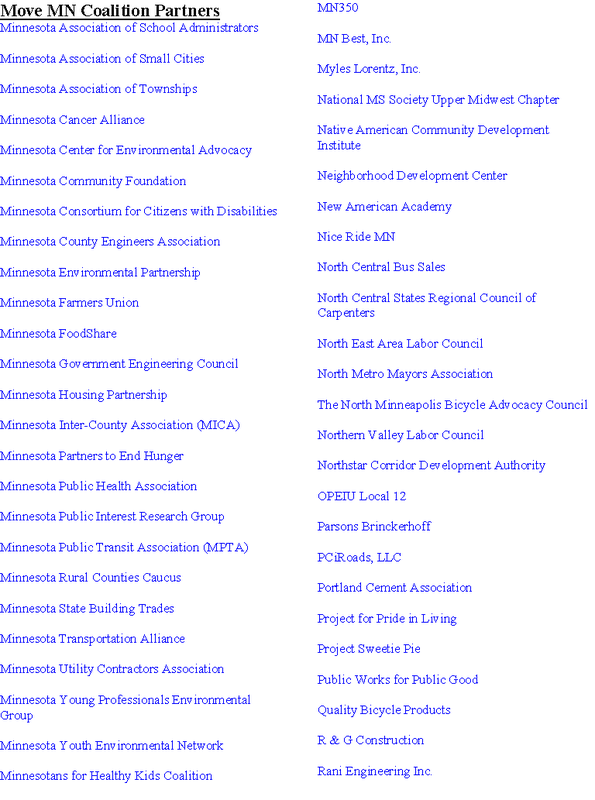 That’s as accurate of a picture as I can create of who Move MN is and what their agenda is. Of the total, $1.26 million would have come out of the state general fund and $2.51 million out of the natural resources fund, money intended to help the Met Council and 10 local park agencies develop and maintain parks that are regional destinations (think Minnehaha Falls). The money that would be lost by the Minneapolis board goes toward annual operating costs. First, I’m totally fine with cutting the Minneapolis Park and Recreation Board’s appropriation through the state budget. If Minneapolis wants a Park and Recreation Board, let them pay for it. In fact, eliminating the state government appropriation is justifiable, in my opinion. Minneapolis Park and Recreation Board’s advocates will argue that they add value to the state. That’s disputable at best. It might help Minnesota tangentially. In fact, I don’t know that a compelling case can be made that the Minneapolis Park and Recreation Board makes Minneapolis substantially better. Most importantly, this is a perfect example of why Speaker Daudt shouldn’t consider funding the Southwest Light Rail Transit project, aka the SWLRT project. 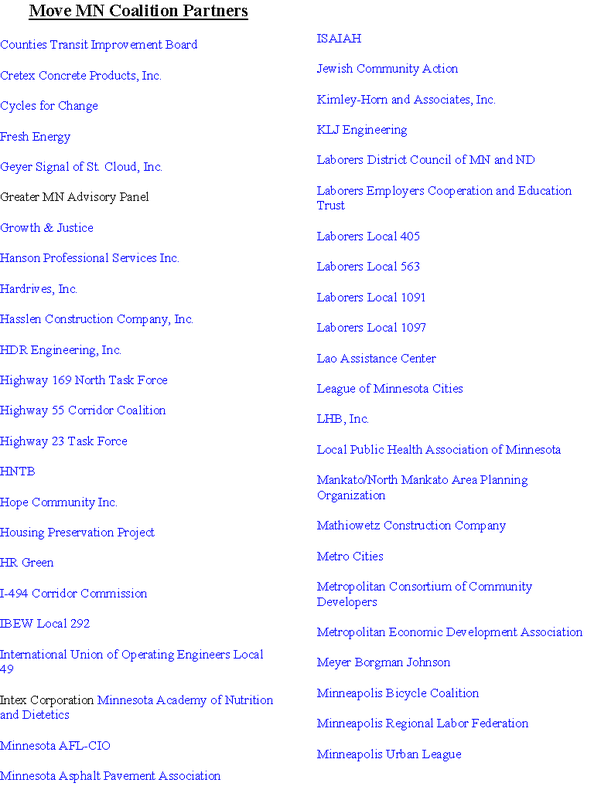 The DFL is still fighting with itself on the SWLRT project. Next, regardless of whether the DFL is fighting amongst itself, the SWLRT project is a major waste of money. It’s spending tons of Minnesota taxpayers’ money on something that isn’t a priority with Minnesota’s taxpayers. The DFL a) is proposing a massive middle class tax increase, b) is still fighting with itself on how to spend your money on their friends and c) is telling Minnesota that paying off their political allies is more important than spending your money wisely. To use Scott Walker’s words, going big and being bold is the way to differentiate between the DFL’s payoffs and the conservatives’ priorities. Going bold is the way for Republicans to win the legislative fight in 2015, then win the 2016 election. A political party divided against itself will soon be defeated. On the website for SCSU’s Office of Strategy, Planning and Effectiveness, you can find the following graph of the historical Fall FYE enrollment. The Fall 2014 enrollment is now in and the result is 5,806 FYE. This is not the ‘final’ enrollment number because that is not due until 45 days after the end of the semester. However, for all intents and purposes, since there aren’t a whole lot of people still being registered for classes, which ended on December 19th, 2014, this is pretty darn close to the final enrollment number for Fall 2014. At 5,806 FYE, the Fall enrollment will be smaller than at any time at least since Fall 1999, which goes back fifteen years! In fact, it is the first time that the enrollment will be below 6,000 FYE in the past fifteen years as well. Since the peak Fall enrollment in Fall 2010 through Fall 2014, the enrollment has fallen 1,377 FYE, which corresponds to a loss of 19.2% over four years! is quite appropriate. After losing 481 FYE in Fall 2011, 336 FYE in Fall 2012, 288 FYE in Fall 2013 and 272 FYE in Fall 2014, pretty soon you’re talking real enrollment losses. That translates into real money. New England head coach Bill Belichick and quarterback Tom Brady both have proclaimed innocence and said they were unaware how the footballs became underinflated. “At no time was there any intent whatsoever to try to compromise the integrity of the game or to gain an advantage,” Belichick said in an unscheduled availability on Saturday afternoon. Notice Belichick’s weasel words in that last paragraph. “We feel like we followed the rules of the game to the letter.” That’s totally irrelevant and subjective. The NFL has confirmed that the Patriots’ footballs a) complied with the NFL’s rules before the game and b) didn’t comply with the NFL’s rules at halftime. That’s an objective standard. Either the Patriots’ footballs complied with the NFL’s rules or they didn’t. In this instance, they didn’t. Coach Belichick, are you saying that the Patriots stay well within the lines of the NFL’s rules? If that’s what you’re insisting, I’d love hearing your explanation for how the Patriots organization was fined for videotaping the Jets’ defensive signals, which isn’t permitted by the NFL’s rules. It isn’t permitted because it gives a team a major competitive advantage. If the Patriots knew what the Jets were doing before they did it, the Patriots could install plays to take advantage of the Jets’ play-calling. That’s a major advantage. What’s insulting is that Coach Belichick was personally fined $500,000 and the NFL confiscated the Patriots’ first round draft pick for breaking the NFL’s rules. So much for the Patriots erring “on the side of caution” and staying “as far away from the line” as possible. Madden’s position makes a lot of sense. Quarterbacks are particular about their footballs. Anybody doing anything to the footballs without the quarterback’s knowledge or consent would be asking for a tongue lashing. In Brady’s case, his tongue wouldn’t be needed to formulate the various “F” words that would be hurled at he who messes with the quarterback’s primary tool. Brady and Bill Belichick. One lies. The other one swears to it. Minnesota drivers would pay more at the pump and at the Department of Motor Vehicles under a plan formally rolled out by Gov. Mark Dayton on Monday, but he says the money would provide vitally needed improvements to roads, bridges and mass transit in Minnesota. In 2010, Gov. Dayton harshly criticized Independence Party gubernatorial candidate Tom Horner’s cigarette tax, saying that Minnesota needed a more progressive tax system. 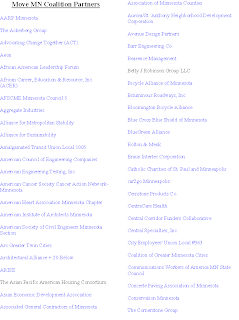 More importantly, where’s the proof that Minnesota’s transit system has a lengthy list of “vitally needed improvements”? 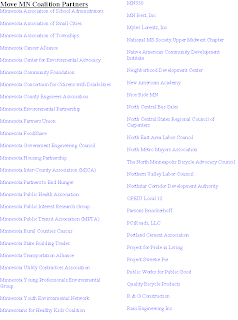 I’ll stipulate that Minnesota’s transit lobbyists have a lengthy wish list of transit projects but I won’t stipulate that there’s a lengthy list of transit needs. It’s indisputable that roads and bridges need fixing. It’s disputable that we need another DFL middle class tax increase to fix Minnesota’s roads and bridges. It’s indisputable fact that the DFL raised taxes and fees by $2.4 billion for the biennium that started on July 1, 2013. It’s indisputable that Gov. Dayton, the DFL and the transit lobbyist wing of the DFL want to raise taxes on the middle class by $1.7 billion for the biennium that starts on July 1, 2015. That’s more than $4,000,000,000 in tax increases that the DFL wants to punish the middle class with in each biennium. The DFL’s thirst for increasing taxes is insatiable. Think of it this way. Oil companies took advantage of the fracking boom, which led to a dramatic drop in gas prices. Gas is less than $2.00/gallon, compared with $3.50/gallon before the fracking boom. The free market giveth cheap oil prices. DFL politicians want to make gas more expensive. In addition to DFL politicians like Gov. Dayton wanting to punish middle class car drivers with higher gas prices and higher taxes, these same DFL politicians want to force outstate Minnesotans to pay for a transit system they don’t want and will never use. I don’t care about expanding Twin Cities transit options. They’re virtually invisible to me. 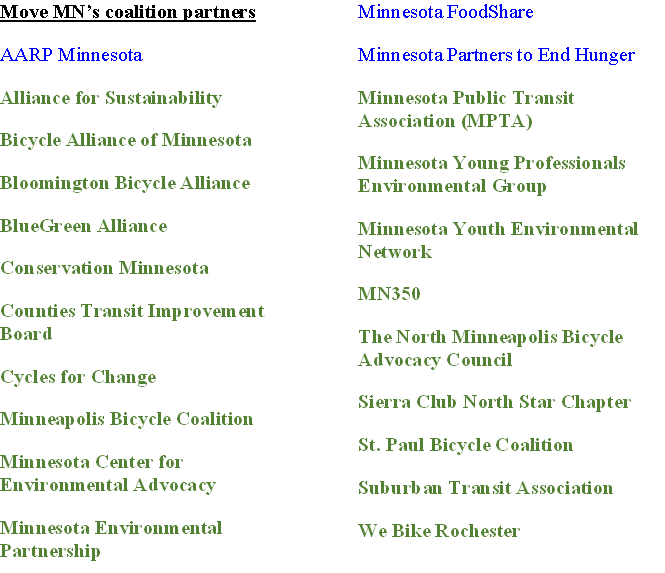 I want the DFL to stop focusing on transit. I’d rather they focused on what’s important, namely fixing Minnesota’s roads and bridges. The top 3 priorities for Minnesota’s politicians should be a) fixing Minnesota’s roads and bridges, b) fixing Minnesota’s roads and bridges and c) fixing Minnesota’s roads and bridges. “It takes some political courage” to approve tax increases, he said, which in this case would not only add a new gas tax but also but also raise vehicle license fees, charge $10 more for car registrations and increase a Twin Cities sales tax. He also pledges to find $600 million from the Minnesota Department of Transportation doing things more efficiently. That’s stunning. When House Republicans offered their proposal, it included a call for greater efficiencies within MnDOT. At the time, Gov. Dayton insisted that the Republicans’ plans were “pure fantasy.” Now that he’s proposing greater efficiency within MnDOT, he’s dropped the mean-spirited accusations. Further, it doesn’t take political courage to raise taxes. If DFL is behind your name, raising taxes is virtually reflexive. It’s like you can raise taxes without blinking an eyelash. If you’re a Republican, raising taxes doesn’t require courage. It requires a brief bout of insanity. Gov. Dayton’s latest middle class tax increase is his latest attempt to punish the middle class. Gov. Dayton and the DFL should be ashamed of themselves for inflicting this much punishment on the middle class.